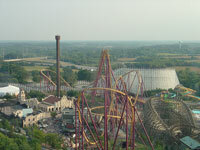 Top of the list of attractions for families on holiday in Chicago is the Six Flags Great America. Featuring some of the country's most exciting theme park rides, such as the Dark Knight Coaster, Bedrock Boulder Roller, and the Condor, the Six Flags Great America Park is a great way to spend the day. The kids will love meeting their favourite comic book superheroes and cartoon characters. You can also cool off on a hot day with the rides at Hurricane Harbour, the attached water park. The amusement park can easily occupy the whole family for a day, with numerous restaurants and snack bars for refreshments and some live entertainment on offer. Opening times: The park is seasonal, and the water park has its own schedule: check the calendar on the website for details. Admission: $75 general admission; $45 child under 48 inches. Discounted tickets available via the website.